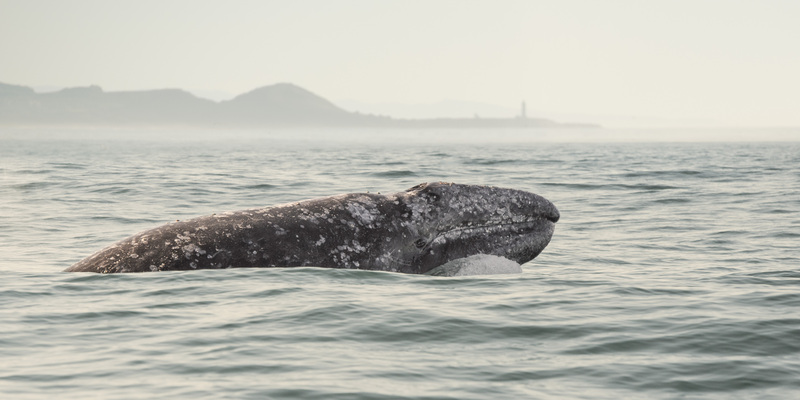 Gray whales are visible off of the Pacific Coast nearly every month of the year, and the highest number of sightings occurring during their annual migrations in the early winter and spring. While the odds of actually seeing a whale are greatest during the migration, the whales are often difficult to spot from the shore because they typically travel around 2 miles out at sea. This makes whale watching in the winter and spring difficult, as the whales typically travel fast and are usually near the horizon. Migrating whales are on a mission to reach their destination as quickly as possible, and they usually forgo eating until they return to nutrient rich Alaskan waters. As the migrating whales travel north each spring, however, a small number spend nearly the entire summer off of the coast. These whales are known locally as “summer residents,” and they provide the best opportunity for whale watching. In April and May you will often see mothers and calves making their way north, and it’s common to see them venture into some of the smaller bays and coves along the coastline, bays such as Depoe Bay, Oregon. Orcas are also more prevalent at this time; they will hunt the gray whale calves and try to separate them from their mothers. Most of the whale watching charters are in full swing by this time and are running multiple trips per day. In the summer months, out of their focused migration mode, the whales found off of the Pacific Coast are in the area to eat. This means onlookers can view the same whales for hours, some just meters from the shore. Gray whales have been seen in water as shallow as 8 feet as they hunt for their prey of choice, mysid shrimp. Spy hopping: This is when a whale sticks most of its head straight out of the water. Sharking: When a whale rolls on its side to feed, half of the tail stays above water, resembling a shark fin. Diving: After a series of 3 to 5 spouts, the whale will dive in order to feed, sometimes showing its tail, or fluke, as it descends. Breaching: This is when the whale launches itself out of the water, which is rare for a gray whales and more common for humpbacks. The number of whales that stay off the coast in the summer varies, but many whales have been seen year after year and have even been named by locals. Oregon’s most famous whale is known as Scarback. One look at Scarback and it’s easy to see where her name came from. She has a large crater in her back that is believed to be from a harpoon wound from the late 1970s or early 1980s. The wound has not healed, but it is kept clean by the large amounts of whale lice living inside of it. While this sounds bleak, Scarback has reached nearly 45 feet and has birthed several calves. The residents in places such as Depoe Bay and other coastal areas have formed a strong bond with these whales, and every visitor who gets a chance to see them will usually come away with a similar feeling. Whether it’s in a zodiac or one of the larger charter boats, there is nothing quite like getting to see these amazing, majestic animals up-close (though keep in mind that boats must maintain a minimum distance of 100 yards from the whales). * Gray whales are more rare in the San Juan Islands. Orca, minke and hunchback whales are common, however. Founded by whale conservationist and photographer Erik Urdahl, The Spout is dedicated to creating amazing encounters with whales. The Spout is taking a hands-on approach to this effort by launching campaigns that directly affect people on an individual basis. The first such campaign, seen in the video above, took first-time whale watchers out to sea with cameras rigged to their life jackets to capture their reactions. The Spout is working to produce more projects that really inspire people to go out and have an adventure of their own. Learn more at www.thespout.org.